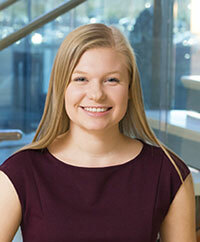 Annie Krumpoch is a marketing analyst at Applied Marketing Science (AMS). Annie’s responsibilities include updating the company’s web content, maintaining AMS social media accounts, coordinating conferences and trainings, assisting with webinars, and supporting the company’s search engine optimization. Annie graduated from Boston College’s Carroll School of Management with a BS in Business Management, double concentrating in Marketing and Finance. Prior to AMS, Annie worked as a research assistant at Boston College’s consumer insights panel, where she helped facilitate studies and collect data. In addition, Annie was a marketing intern at AMS before joining full time. She also held an internship in human resources at Suffolk Construction company. Originally from Shrewsbury, MA, Annie enjoys traveling, listening to hip hop music and watching Patriots games. In college, she studied abroad in Thessaloniki, Greece, and is now attempting to become fluent in Greek. She also enjoys gardening and has an ever-growing collection of plants. Annie owns a cat named Groot and also looks forward to owning a dog one day!